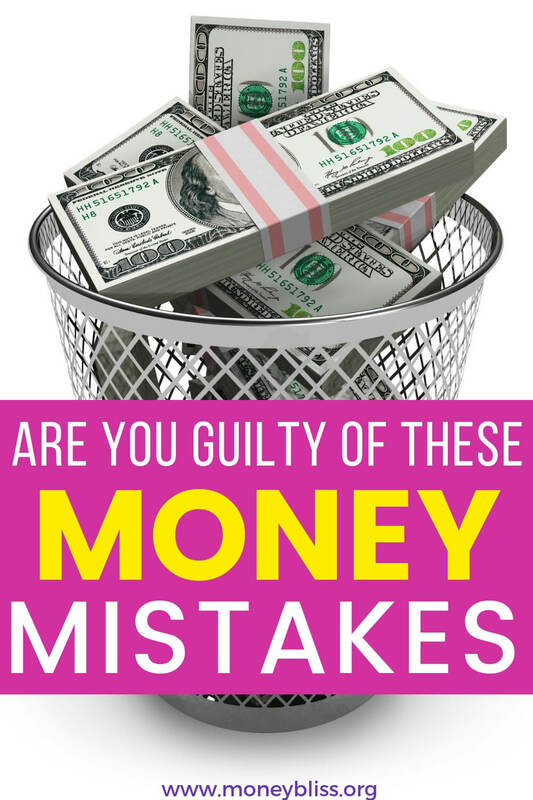 Are you guilty of these money mistakes? No matter how hard we try and get away from money, it just isn't going to happen. Money decisions have to be made. Whether we decide to make good decisions. Ignore making money decisions. Or ultimately, make bad decisions with our money. Just last night, someone was telling me how much the loathed the idea of having to manage money. The impossibility of success is next to nothing. The full guarantee of living paycheck to paycheck and always being broke will continue. Learning to manage money doesn't have to be painful. You just have to be willing to figure out how to manage money your way, your style for your situation. In the same conversation last night, another lady and I shared how we manage money. And guess what? We couldn't be on the complete extreme opposite sides of the spectrum. Yet, it worked for each of us. 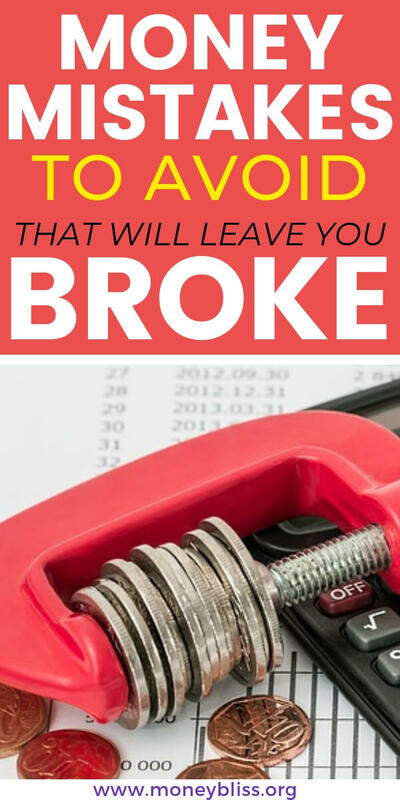 If you want to stay broke, then pin this post for when you are ready. And come back to read it when you are ready to learn from your money mistakes. 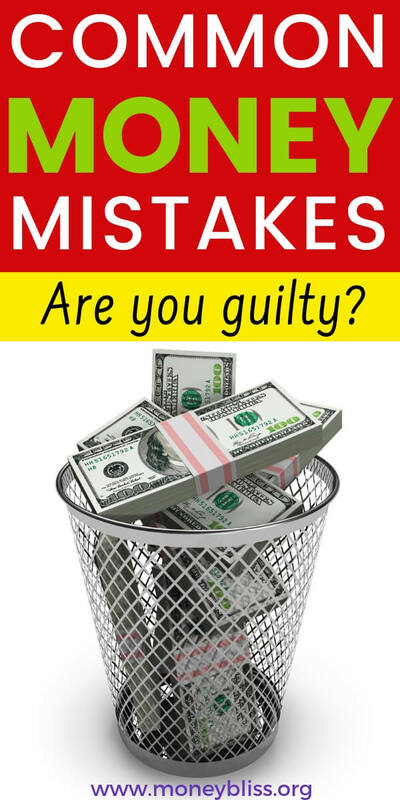 If you ready to change your personal finances, then make sure you are not guilty of making one of these money mistakes. Take time to understand what caused your mistakes and what you can do better next time. Many people focus on money mistakes to avoid in your 20s. But, it doesn't stop there. 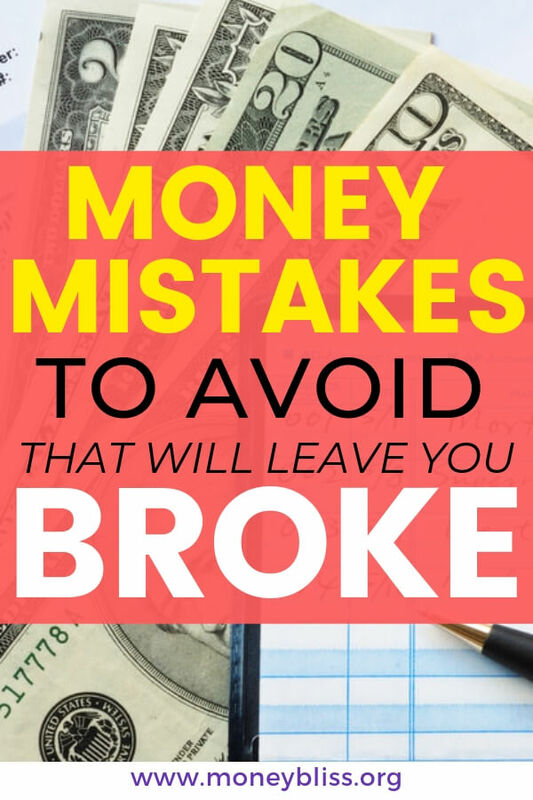 These are money mistakes to avoid throughout your life. Then, you can focus on becoming financially free and secure. 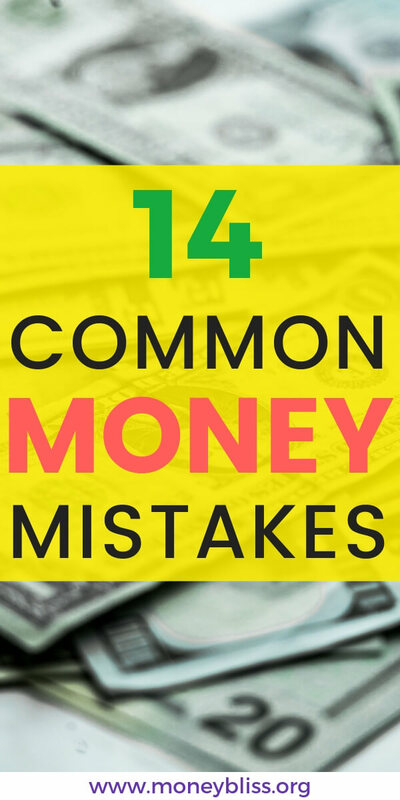 There are times we all ebb and flow through any of these money mistakes. The key is to learn from it and move forward. Are you ready to improve your personal finance situation? If yes, keep reading! Your mindset will make or break it. For example, if you are rushing out in the morning and can't find your keys, you have one of two options. 1) Throw a tantrum because you can't find them or 2) be grateful you have a car to drive. Because honestly, in the end, they will turn up eventually. It is how you handle things in the moment that determines your mindset for the rest of the day. Above is a simple example of money mindset. In one of my favorite books, The 12 Week Year, Brian Moran states you are more likely to achieve your goals if you state them in a positive manner. Life is about your money mindset. Which path do you want to take? The pity me attitude won't get you far in life. While some people have success with conning others out of money over and over, eventually that money well will dry up. Nine out of ten times a financial emergency is caused by lack of preparation in building a solid emergency fund. That is your money mistake. The pity me attitude has to change at some point. Remember above, a positive attitude is more likely to achieve results. Those things will lead to financial ruin especially with your credit score. Have you ever calculated how much you can buy using credit? This is a serious question. And the answer might astound you!! The lenders are great with numbers to figure out the MAXIMUM AMOUNT they can loan you. They don't take into account what you are actually ABLE TO PAY BACK. They make money by you paying them interest and many cases that interest can add up quickly. So, before you make your next purchase decide how much you can truly afford. Better yet, save up and pay in cash. Many times, you can get an extra discount for paying in cash. A budget isn't meant to be constricting. That is why at Money Bliss we like to refer to it as a Cents Plan. The purpose of a budget is to spend less than you make. No fancy math needed for that equation. Stop making this money mistake and start a budget that works for you. Do You Know the Ideal Household Budget Percentages? I'm guilty of this one, too. I wish I would have started with my very first job and set at least 15% aside each paycheck. This is a simple fix. Start saving for retirement now. Honestly, how hard would it be to live on fifteen percentage less each paycheck? The money can be automatically taken out by your employer. By the end of the month, you may notice that you have less discretionary money to spend. But, by saving your money, you are investing in your future. This money mistake is easily fixable. Talk to your employer's HR department or open your own Roth IRA account. My example at the beginning is an attitude of many people… maybe if I stop looking or opening mail, then the problems will solve themselves. Oh, how do I wish that were true!! But, it's not. Then, money mistakes wouldn't be money mistakes. At some point, the reality of your money situation needs to sink in. And the sooner, you start looking at your finances the better. If you are clueless where to start, then read our Money Bliss Steps to Financial Freedom. Plus bookmark it for reference. While you may easily think, it would take forever to get ahead by saving your pennies. Your mentality is SO off track. A penny is important. Just like a twenty dollar bill. In all honesty, it isn't about the pennies. It is about the habit and pattern of adding a penny consistently that makes a person rich. By realizing a penny is important, there is a shift in your thinking and how you process and spend your pennies and the rest of your money. Emotional spending can cause financial ruin. It is so easy to let our emotions rule our decisions. The marketing geniuses know they can win us over too! This money mistake can cost you a small amount of money all the through the point of bankruptcy. Think about it… What decisions have been made purely on emotional spending? More than likely… these are the purchases that you regret soon afterwards. Or the ones still with tags on? One simple way to overcome emotional spending is to use the spending wish list. This free printable helps you understand what is truly a need vs a want. You can download your copy and other great freebies in our resource library. Oh, this is one of my personal biggest money mistakes. When I decided to take out student loans, I truly did not understand the true cost of debt. I was swept over by the increased salary that I would make once I was out of school. Let me tell you… when I paid off that debt, I truly understood every penny that went into paying it off. With debt so easily accessible in every part of life, it is easy to be caught in the debt cycle. Learn from my mistakes. Pay off debt ASAP. Then, avoid it like the plague. Are You Making One of these Common Debt Payoff Mistakes? In order to be successful, you have to build a strong foundation with money. Here at Money Bliss, we talk about the Money Bliss Steps to Financial Freedom. A path to follow to help you build a solid foundation with your personal finances. That way, when something unexpected happens (it is only a matter of when), then you are able to withstand the shock and overcome it financially. An emergency fund begins the backbone to financial security. If you don't have an emergency fund in place, then learn how to save money fast. Money is one of the top causes for arguing. Why pick a fight and borrow/lend money from friends or family. Yet, this money mistake happens over and over. For those borrowing money… You need to handle your own affairs. If you can't pay with your own cash, then you shouldn't buy it. Period. For those lending money... Stop the free handout. They borrower hasn't learned their lesson yet and needs some tough love. This is a money mistake that can ruin relationships. This is a huge money mistake. Thanks in part to the easy accessibility of credit and debt methods, it is easy for many people not to realize their spending is out of control. Spending must be less than income. More money needs to come in and not go out. Many people may be struggling to make ends meet, but in reality, it may be the inability to say no to purchases and stop the out-of-control spending. Without a vision, you are destined to continue on the same path and stay in status quo. With a vision, you are more likely to make progress with your goal and succeed. Some people loathe the idea of goal setting and planning (I am married to one of them). However, whenever he jumps on board to look at our yearly visions and smaller monthly goals, we make so much more progress as a team. Financially speaking, I think this book is one of the best personal finance books to find your vision and how it correlates to personal finances. Don't make this money mistake of not taking the time to find your vision. It is crucial part of creating the life you want to live. The elephant is in the room. No one wants to discuss money because it leads to arguments and fights. Nothing will ever change. Your right… nothing will ever change. UNTIL you decide to communicate about money. This is a common money mistake for many couples. One person is trying diligently to change their ways with money while the other person is doing everything possible to make it harder. A simple way to overcome this money mistake is to sign up for my free Jumpstart your Money Mindset course. Through daily emails, you are provided with the questions to discuss. This opens up the opportunity for healthy conversations and a baseline to understand each other's feelings and perspectives. If your significant other isn't ready to participate, then keep on trucking ahead and be diligent with money how you can. Don't start a fight at every opportunity. Highlight the positive changes you are already seeing in your finances. In the end, opening the lines of communication will be better for your money situation. Until you are able to self-insure yourself, then insurance is a must. And most people don't have enough money to self insure anyway. This is the boring part of finances that need to handle a head of time. This money mistake can end up costing you quite a lot if you aren't insured properly. The saying of “it won't happen to me” works until it does happen to you. If you are looking to save money on the cost of insurance, look at the increasing the deductible amount to something you can afford if you need to pay it. As much as I didn't want to admit it, it was just a season. Like when we buckled down to pay off debt and become debt free, that was just a season. We could have kept living on going our way and eventually have paid off our debt 20 years later. Instead, we decided to make paying off our debt just a season. And it was a short season – one year. Your money mistakes aren't just a season if the continue year over year, time and time again. If so, then let's change your personal finances now! Why is it so difficult for me to look at my money mistake? When did this money mistakes start or accelerate at a fast pace? What can I do RIGHT NOW to change my money situation? It is possible to overcome your money mistakes and become financially independent. All it takes is you discovering that something needs to change. This is YOUR Cents Plan. Not a budget. You decide where you want to spend your money. Success! Now check your email to confirm your request and download the freebie we promised you: Cents Plan. **There is a very important email waiting for you. Please take the time to click the link! You must do this! Then, you will be on your way to Money Bliss!